Create a standard mailbox enabled user (e.g. svc_xch_cmn_fb) in Exchange. This will be used by CMN to query Exchange F/B information. 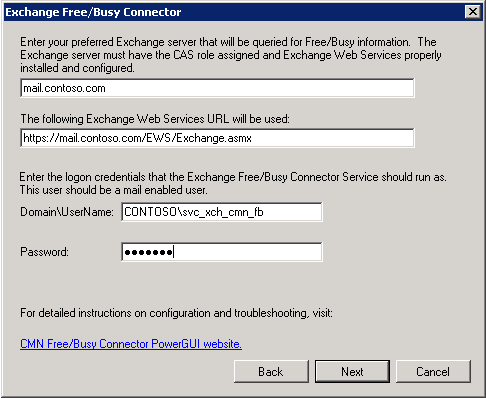 Browse to PowerGUI\CMN Free/Busy Connector Management\Configure Domino Server and Exchange Components. Launch the Configuration Wizard from the task pane. Note: This is generally the URL which end users would access your CAS servers with internally such as for OWA. While the PowerGUI UI suggests you should enter a specific CAS server, it is better to enter a load balanced URL or at least the friendly URL listed on your SSL certificate. In this example we will use mail.contoso.com but you should substitute the value most appropriate for your environment. Start the Quest CMN Exchange Free/Busy Connector Service service. Configuring your Exchange organization is perhaps the easiest part of this project. You’ll simply need to configure an Availability Address Space for lotus.contoso.com. If you’re not familiar with this, take a moment to review this post. The final server component you’ll need to configure is the QCALCON task. Tasks are background processes of sort in Domino at least to the extent I understand them. You can configure them to either run at startup or at a specific time. For this step, install PowerGUI and the CMN Domino Server Components on LN-ADM01. The task and its configuration files are installed directly in the Domino server folder (e.g. c:\lotus\domino). Configuring the QCALCON task is quite straight-forward. If prompted to browse for the Config File, you’ll find it under your Domino installation folder (e.g. c:\lotus\domino\qcalcon.exe.config). Select Set Foreign Domain Name in the task pane. Enter mail.box when prompted. 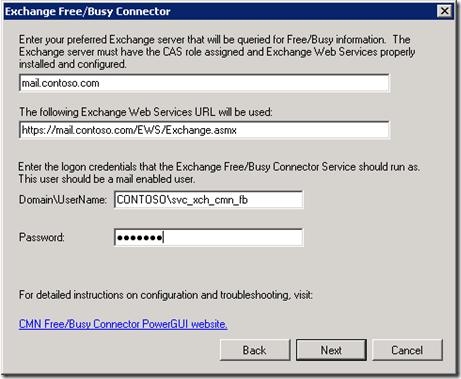 Select Set Exchange Free/Busy Connector host name in the task pane. Enter Q-EXFBC01. Open your notes.ini file (likely in c:\lotus\domino\notes.ini), and verify that the ServerTask= line includes qcalcon. If it doesn’t, add it to the end of the list. Note: You may need to provide a fully qualified hostname in step 4. Once you’ve configured QCALCON, you can start the task. Note: If you need to change any of the values in the QCalCon config file, you’ll need to restart the task. To do this, you can issue a “tell qcalcon quit” command in the Lotus Domino Console. In the next post in this series, we’ll look at configuring the proper documents in the Notes configuration as well as configuring test users in Exchange. Published June 26, 2011. Last Updated August 16, 2014.